The word ritual has come up a lot for me in the last few months especially while I was deep thinking about Kindred + Wild. I talk about rituals a lot. Sometimes, I feel I’m constantly either trying to make rituals or stick to them. And it got me thinking what is a ritual anyway? How is it different to a routine? Why is it important?Here’s what I came up with. Routine is a regularly followed procedure, something we do out of discipline and habit. And that’s the crux of it. Routine is rather utilitarian - We aim to get into a routine with a hope that it becomes habitual and eventually automatic. Like brushing our teeth in the morning. We do it automatically, without paying attention to the actions, sometimes with our eyes closed, while we our thoughts wander off to thinking about breakfast, our emails or going back to bed. Ritual is also a set procedure performed regularly. But a ritual is infused with intention and presence of mind. It consciously marks a certain time or action as more than mundane. It is also symbolic of something else, something more than the activity itself. Like when I spent a whole evening in candlelight to mark Sawhain last year. This activity of spending time in darkness was symbolic of something deeper. I was consciously thinking of the coming of winter and being at ease with the darker months. It marked out that evening as different to our usual ones in acknowledging the shift in the season. 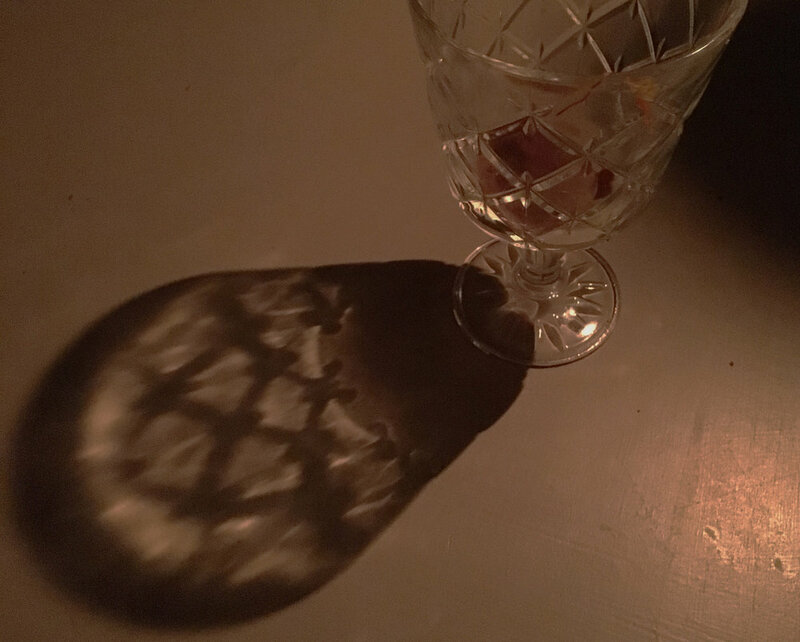 I also found myself noticing new things with awareness like the long shadows of glass in candle light. Cooking food by candlelight was also an experience. Symbolism plays a huge role in the human psyche whether we are aware of it or not. We evolved to see and interpret patterns. It was essential to our survival and therefore, deeply ingrained. All of human communication, language is based on collectively understanding symbolism. So it’s perfectly natural for us to intend our actions to mean something deeper. While routines make our lives and days more efficient and easy, rituals help us be aware and connect to ourselves and to something bigger than ourselves. The dictionary defines ‘ritual’ as ‘a religious or solemn ceremony consisting of a series of actions performed according to a prescribed order.’ Understandably, it has had some bad reputation in the past but has seen a resurgence in recent times especially when it comes to self care. To me it is simple and pure when performed with clear and good intentions. Another thing that differentiates a ritual from a routine is time. While we set a routine for efficiency and to save time, one has to make time for for a ritual. Take time in planning it, make time for it in your schedule and dedicate the time to do it whether its 15 mins for a bath or an hr for a walk or and afternoon for a gathering. A ritual does not have to be complicated. In fact, I think it should be really simple and easy otherwise I find it hard to stick to it and repeat it. Routines can also become rituals. A simple routine of applying face oil can become a ritual when done with intention, mindfulness, taking a few extra minutes to slowly massage the face with gentle strokes. I think both routine and ritual have their place and purpose in our lives. For someone who loves idea of rituals but isn’t very good at consistently following them, I think this reflection on routine v/s ritual will help me stick to them better. We all have many little routines I’m sure. But I’m curious to know what rituals do you have or would like to make up?